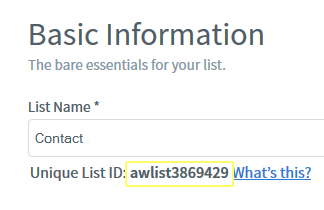 When setting up a form in one of our plugins to use Aweber, you will be asked to insert your Aweber listname or (unique list id). This is usually the only piece of information that is necessary for your form to work with your Aweber list. The plugin puts all of the other necessary data on the form, including the url to submit to when a user subscribes. 1. 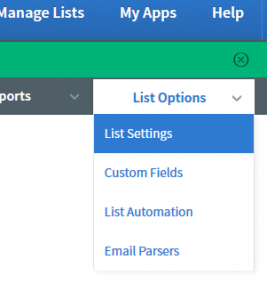 Login into your Aweber account and click on List Options>List Settings. 2. Copy the listname (Unique List ID). It is the name inside the yellow box on the following illustration. 3. Paste the listname in the box labeled Aweber List for your form in the plugin you are using. Be sure not to have any spaces before or after the name when you paste it. That’s it. The Aweber form will submit to your list when a user subscribes. Go ahead and try it out.